A welcome start for any spring event, appetizer, or a light dinner, our flatbread is chewy on the inside, crispy and crunchy on the outside. 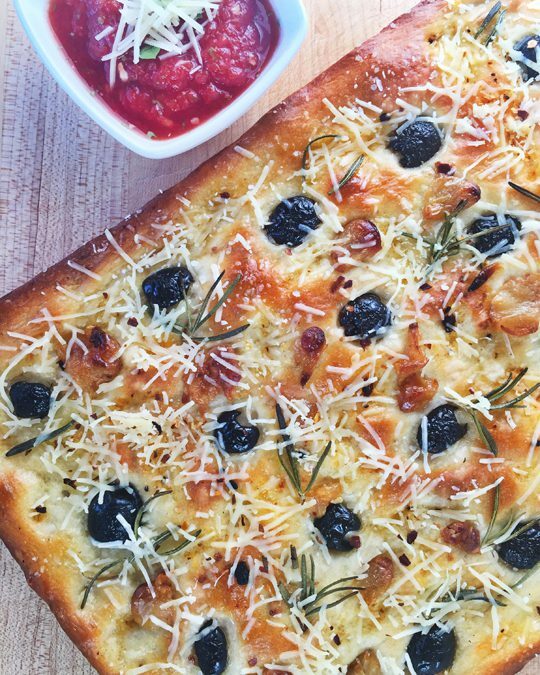 Covered in roasted garlic, black olives, parmesan cheese and fresh rosemary, it’s perfect for dipping in a fresh tomato sauce. You can substitute green-pitted olives for the black or if you’re not an olive fan, the flatbread tastes great without the olives too. This recipe showcases the pizza dough, so use a high-quality brand of either thawed, frozen store purchased or fresh homemade. Preheat an oven to 375˚F. Cut the top off the garlic bulb exposing the cloves. Place on top of a piece of foil in a small baking pan. Sprinkle with olive oil and salt. Place on a sheet tray and bake for 20 minutes until the cloves are browned and softened. Remove from the oven but leave the oven on. Cool slightly so you can remove the roasted cloves from the garlic skins. Lightly brush olive oil on a 9”x13” quarter sheet pan; sprinkle the pan lightly with salt. Roll out the dough on a floured board to 12 x 14” then press the pizza dough evenly to fit inside the pan. Set aside. Preheat the oven temperature up to 450˚F. Brush the top of the dough lightly with olive oil and sprinkle with salt. Place the black olives, roasted garlic cloves, and rosemary evenly on the dough and pressing them slightly into the dough. Top with ½ cup shredded Parmesan Cheese. Place in the oven and bake for 12-15 minutes until the edges and bottom are browned. Remove and cool slightly. Cut in half lengthwise then into 16 long pieces. In a blender add the fresh tomatoes, ½ teaspoon salt, ¼ teaspoons black pepper and the garlic powder; process until smooth. Pour in a serving bowl and top with the remaining cheese and basil leaves. Serve on a platter with the cut flatbread. Make 4-6 servings.